THOUSAND OAKS, Calif. -- A dog set on fire on New Year's Day in Tijuana, Mexico is now recovering in a pet shop in Thousand Oaks after it was brought into the country by rescuers. The pit bull mix, named Xena, had her back and tail burned before rescuers were able to put out the flames. Still, the dog was left with some part of her back bone exposed and no hair or skin on her back. 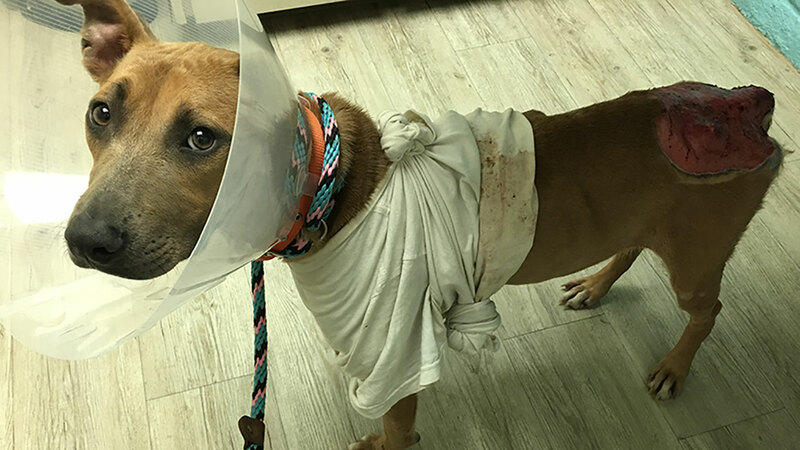 After weeks of the dog surviving on the streets on her own, an online outreach effort was launched by the people who originally saved the pit bull. Shelter Hope Pet Shop, an animal rescue in Thousand Oaks, offered to take in the animal and provide it immediate attention if Xena was able to get past the border. Two volunteers answered the call and smuggled Xena in the back of their trunk where they met Shelter Hope in San Diego. Xena was then treated at Camino Animal Clinic in Thousand Oaks and was started on antibiotics and laser treatment. In the weeks since, Xena has seen vast improvement, but will require surgery on her tail, as well as many other surgeries. Shelter Hope is accepting donations to cover the rest of the pit bull's expenses. A $5,000 reward is being offered for information on who set the pit bull on fire. Contact 805-379-3538 if you have any information.